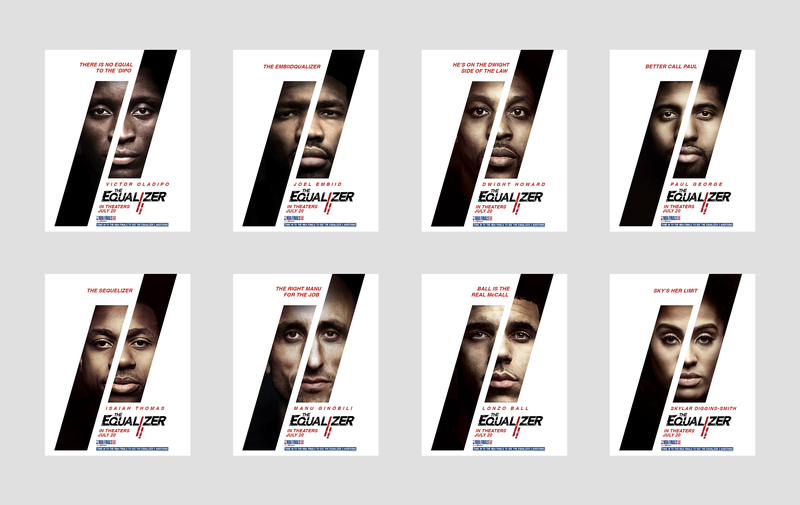 For Sony’s The Equalizer 2 and The NBA Finals on ABC, CreativeWorks and Sony marketing developed a series of promotions portraying the conceit that the film’s star, Denzel Washington, is not interested in doing the sequel to the first Equalizer film. The first spot depicts director Antoine Fuqua pleading with Denzel to do the sequel, but Denzel counters with the idea that Antoine should try to find a replacement among the stars of the NBA. Antoine proceeds to conduct auditions with a broad array of NBA talent, including Dwight Howard, Lonzo Ball, Joel Embiid, Paul George, Isaiah Thomas, Skylar Diggins, Manu Ginobili and Victor Oladipo. The ensuing shenanigans are hilarious, of course, but also infuriating for the director Fuqua. These auditions are highlighted in six additional spots, while the series then wraps up with Denzel showing up at the auditions and, with Antoine’s desperate plea, finally agreeing to do the sequel. The eight TV spots were supported with social posts by each of the players featured, including Instagram Stories featuring behind the scenes content, as well as a series of spoof movie posters that the players posted on Twitter and Instagram.